Buy More Color Tissue Paper 20x26 Save More! 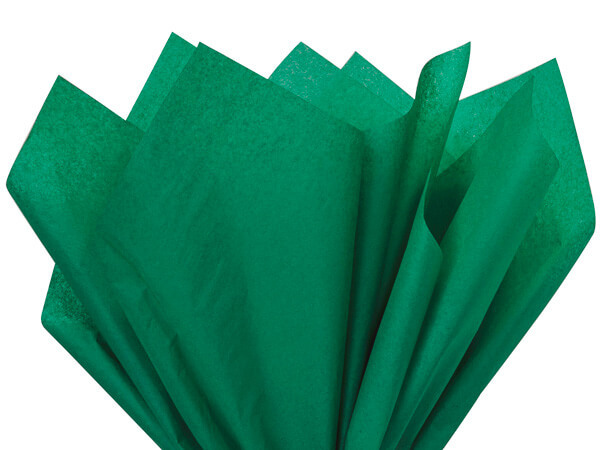 Emerald Green Color Tissue Paper 20x26" sheet - 480 sheets per pack. Color Flo Tissue Paper is made from 100% Post Industrial Recycled Fibers. Green Way ® Eco-Friendly Packaging. Made in the USA. Put a unique spin on any Gift Bag or Gift Box with your favorite shade of our 20x26 Color Tissue Paper! Available in full reams of 480 sheets, our bulk tissue paper comes soft folded at wholesale prices to help you save space and money. Made with a high quality finish, our vibrant tissue paper is able to resist running, bleeding, and fading of colors. From party decorations to arts and crafts to wrapping the perfect gifts, our tissue paper is an everyday essential that no one should be without! Thanks to such a wide variety of shades, you'll be sure to find the perfect color for any season or reason! We believe in our product and think that you should too! Made right here in the USA and guaranteed through blind testing, our 100% recycled Green Way® tissue paper will not disappoint. Our tissue has been shown to be equal to or exceed the look and feel of any color tissue on the market today. Given that our colored tissue paper is 100% recycled, there is a slim possibility that short fibers may show small pin holes or specks. However, we can guarantee that this does not take away from the performance or look of our delicate yet durable gift tissue paper!